The Christian life is likened to a race. There’s a prize to attain, a goal to reach, and just as in athletics if we want to win the race we must train for it and be in good shape. If we’re spiritually fat and unfit there’s no way we’ll win the race. Jesus said eternal life is to know Him, John 17:3. Our relationship with Him is key. If we don’t know Him then we can only expect rejection instead of being allowed to enter into the Kingdom of heaven! That’s what Yeshua (Jesus’ name in Hebrew, his native tongue) said in Matthew 7:21-23. It seems from that passage there will be many who think they’re entitled to enter heaven but will in fact be rejected. They may have the religious labels, they may be good people, but if they don’t know the Lord they actually will be left with nothing. It’s a massive lesson for us. The Apostle Paul said he came to a point where he realised that everything else he had in life was actually worthless compared to knowing Yeshua, and that he pressed on towards the goal for the prize of the upward call of God in Christ Jesus.Phil.3:7-14. That’s exactly what we should do too! Knowing Him starts with repentance and being born again, but it doesn’t stop there, that’s just the beginning! We need to be in good spiritual shape, in daily training, spending time with Yeshua in His word and in prayer. John 15:7-8. And just as an athlete is in constant training, so God allows us to go through various trials and difficulties so that we will learn to be fitter spiritually, growing in patience, faith, endurance, (James 1:2-4) and becoming strong in the Lord. Ephesians 5:10. We are encouraged to be disciplined and lean so that we can run the race. 1Corinthians 9:24-27. Ultimately of course the prize will be ours when we see Him face to face. John says when we see Him we shall be like Him, 1John 3:2. As believers who know the Lord and who walk with Him daily, we are part of His bride, the bride who is preparing herself to meet the bridegroom. And the joy of the union between the bridegroom and the bride is the ultimate prize, the ultimate reward. Jesus said He is preparing a place for us and that He will come back and receive us to Himself so that we can be with Him, John 14. In the meantime we watch and wait. We have trials and difficulties, all part of the preparation process. But we keep our eyes on the goal, we keep pressing on towards the prize. We lay aside every weight and the sin which so easily ensnares us and we run with endurance the race that is set before us, looking unto Jesus, the author and finisher of our faith, Hebrews 12:1-2. 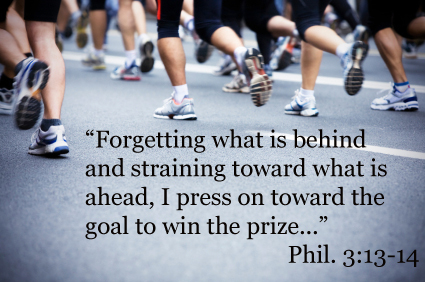 We forget those things which are behind and we press on towards the goal, Phil.3:13. If the way seems hard and dry don’t forget God’s promise to make a way in the wilderness and that He will provide us with rivers in the desert, Isaiah 43:18-19. So, keep your eyes on Him and press on in your in spiritual training! Your Heavenly Father has a prize for you to attain and a goal for you to reach, all by His grace!